Why women are getting it wrong when it comes to walking and sitting in high heels..
Push your weight through the pelvis. Your ankle gets lifted up, knee bent and then straighten onto the floor. A traditional walk is heel-toe, and whilst in heels this is still true, it shouldn’t be as pronounced as when in flat shoes. How to walk in heels without pain? The rule of thumb for any footwear is that they need to be comfortable. So, firstly choose something of the right size, fit and a design that complements your feet. I have friends with big feet who almost never find good footwear and the ones that fit them well. My advice to all of them is, wear heels that are snug yet comfortable inside out. Anyone who spends long hours standing in heels should always use shoe cushions. This helps a great deal. How to walk in heels comfortably? Anything that you are trying to force will cause discomfort. So, unless you are a pro in handling six-inch heels, stay with platforms or wedges. It gives you both comfort and style. How to walk in heels without falling? Two simple rules—Take it slow and take baby steps. This will never fail you. As a beginner, you can skip dancing, running or jumping in heels. Plus, remember the rule of inclining back and angling your feet to the side while walking. Yes, that pretty much takes care of it. How do I learn to walk faster in heels? Walking faster comes with practice. So don’t rush it. If you want to learn faster stick to smaller heels and wedges. 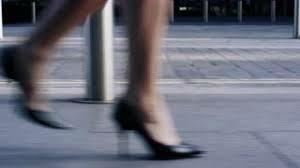 Once you catch up with them, it will be a matter of time before you can walk fast or at your normal pace in heels. But the reason we love heels is how good one looks having them on. So focus on walking gracefully with your heels on, and the pace will eventually pick up! How to sit like a lady? Want to learn more about ladylike skills..